Like everything else in life, even jewelry needs a makeover. Last year, I had a bunch of Precious Metal Clay ( PMC) that I wanted to try. After all the hype of the wonders of PMC, and the zillion questions my students ask me about PMC, I figure it was time to try it out. PMC is extremely fine pure silver particles in an organic binder, so it is a silver clay. Upon playing with it, it was like a plasticized rubber, it doesn't stick to itself and you have to be very gentle with it. Once you finish working with PMC, you let it dry out, just like regular clay, and then you fire it in a kiln at 1500 degrees or less, depending on the type of PMC you are working with. There are 3 grades of PMC, Original, PMC Plus and PMC3. Once the PMC is fired, the organic binder burned off the and silver particles fuse together to create a piece of pure silver. You have to brush it or tumble it to get it shiny. I found I did not like PMC. I prefer to pound my metal, torch it, fight with it and having to be very gentle, using delicate movements was not my cup of tea. In other words, I like metal fighting me. 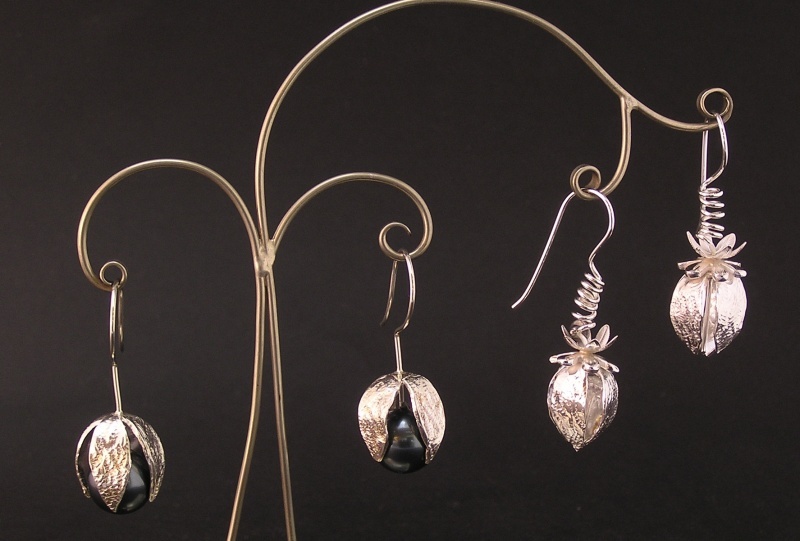 I made a series of 4 petal flower earrings out of PMC, and used glass pearls as accents. After a year, it was clear people were not responding to the earrings, so yesterday, I took a pair of earrings and completely made over it. Took off the glass bead, took off the original earwire, and added little flower accents, added a new earwire that I coiled to give the tendril look. I really like the new look very much. As you can see from the photo, the earrings on the left are the original design and the earrings on the right are the new made-over version. I will be making over the original earrings asap. Now I have to think of a new name for the made over earrings. PS - it was 60 degrees in NH - yeah - Spring is coming!! !